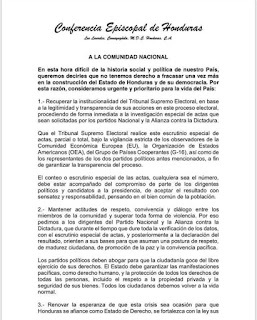 1 – Recover the institutionality of the Supreme Electoral Tribunal [TSE], based in the legitimacy and transparency in its actions in the electoral process, proceeding immediately to the special investigation of the actas which are requested by the National Party and the Alliance Party against the dictatorship. That the TSE realize the special scrutiny of the actas, partial or total, under the strict vigilance of the observers of the European Economic Community (EU), the Organization of American States (OEA), the Group of Cooperating Countries (G-16), as well as the representatives of the two parties previously mentioned. In order to guarantee the transparency of the process. The counting and the special scrutiny of the actas, whatever the number, ought to be accompanied by the commitment on the part of the political leaders and candidates for the presidency to accept he result with judiciousness [sensatez] and responsibility, thinking of the common good of the population. 2 – Maintain attitudes of respect, coexistence [convivencia], and dialogue between memebrs of the community and to overcome every form of violence. 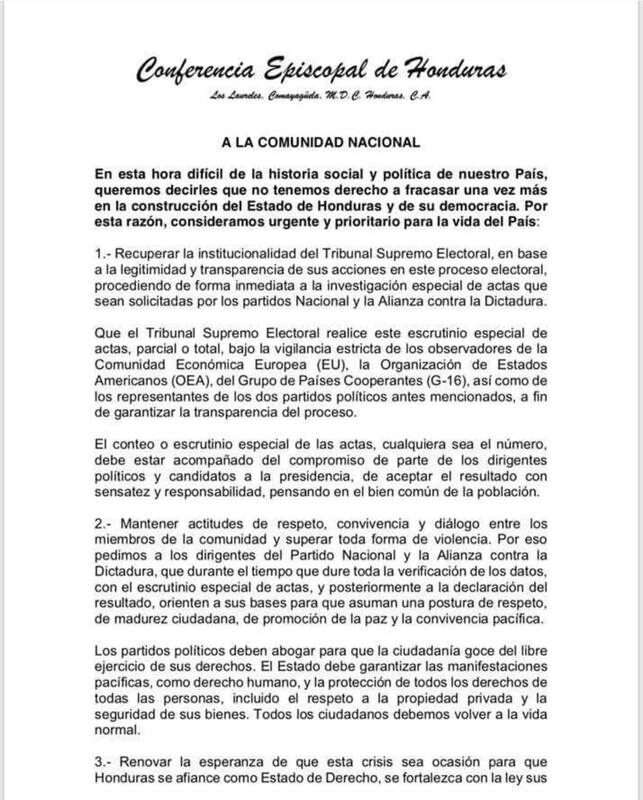 Thus we ask the directors of the National Party and the Alliance against the Dictatorship, that, during the time which lasts for the verification of the data, with the special scrutiny of the actas, and later when the results are announces [declaración], they orient their bases to assume a posture of respect, of maturity citizenship, of promotion of peace, and peaceful living together [convivencia]. The political parties ought to advocate so that citizenry enjoy the free exercise of their rights. The State ought to guarantee peaceful protests [manifestaciones], as a human right, and the protection of all the rights of all persons, including respect for private property and the security of their goods. All of us citizens ought to return to normal life. 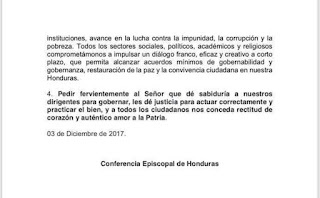 3 – Renew hope that this crisis may be the occasion for Honduras to establish itself [se afinace] as a State of Law, that it be strengthened with the law [in] its institutions, that it advance in the struggle against impunity, corruption, and poverty. 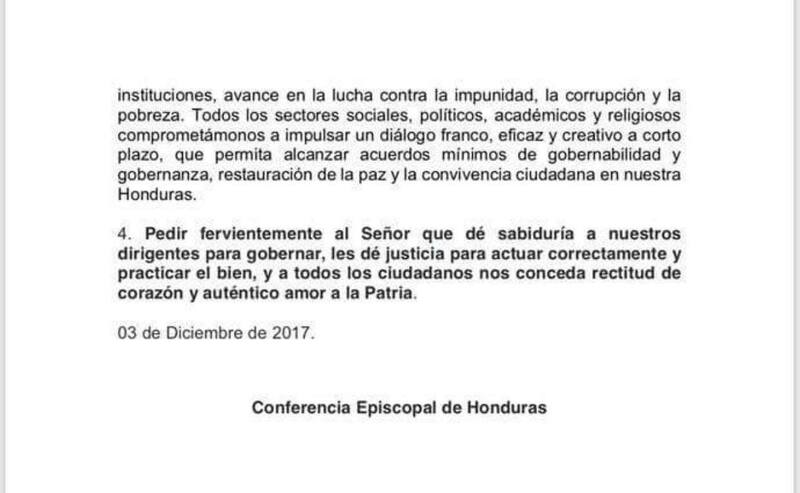 All of us - the social, political, academic, and religious sectors – let us commit ourselves to push for [impulsar] a frank, effective, and creative dialogue in the short term which allows us to achieve minimal agreements of governability and rule, restoring peace and citizen coexistence [conviviencia] in our Honduras. 4 – Fervently ask our Lord to give our rulers wisdom to govern, justice to act correctly and to practice the good, and that he give all of us citizens rectitude of heart and authentic love of the Fatherland.